I grew up in a trilingual household: French/English/Flemish. Is this one of those rare instances where French is more straightforward than English when it comes to gender? I'd be interested to know why French doesn't differentiate based on gender in this case, and if other Romance languages are similar. Another pronoun sharing the same characteristic (same pronoun in French, different ones in English) is se. Le voy a enviar una carta. I'll send him/her a letter. Les voy a enviar una carta. I'll send them a letter. The 3rd person singular direct object pronoun is differentiated: le vs. la. But the 3rd-person singular indirect object pronoun is not: lui. The overlaps can be because the pronouns merged, because they were already the same in Latin, or because there were gaps in Latin and not all of them were filled. I think it's an interesting point you raise that such a gendered language would end up with a number of undifferentiated markers: lui, leur, les, se, and even articles like l' and des. These cases are called epicene / epicène. In any case, the question here is, does téléphoner take a direct object or an indirect one? Do you say Je téléphone Jeanne or Je téléphone à Jeanne? So your sister is right: You use lui, which isn't differentiated. In general we dintinguish between verbs that take a direct object (without the intervention of a preposition) and those that do not. 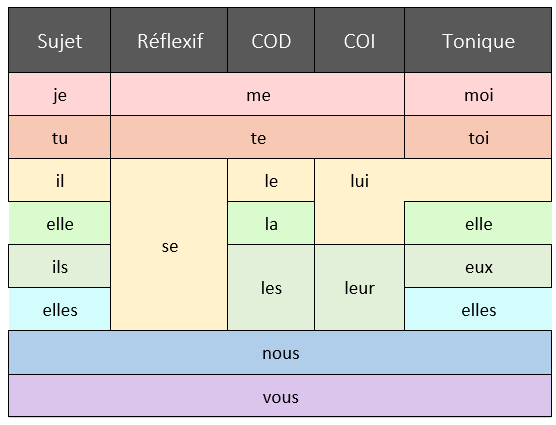 Appeler belongs to the first category (takes a direct object; accusative) whereas téléphoner belongs to the second one (takes an indirect object; dative). J'appelle mon amie. I call my friend. Je l'appelle. I call her. Je vais téléphoner à mon amie. Je vais lui téléphoner. Many French intransitive verbs may take an indirect (dative) object as in English. The dative form of nouns and some pronouns is obtained by adding à; other pronouns have special dative forms. Je donne le livre à mon frère => Je le lui donne. Il leur offrit un cadeau. He offered them a present. Many transitive verbs may be constructed with the preposition à without representing the dative, but some other idea, such as motion to, direction of thoughts, etc. This distinction (i.e. between dative and non-dative) affects the form of some pronouns. Il va à l'église (Il y va). Elle y courut. L'enfant est venu à moi. L'idée leur est venue. The idea came to them. Cela lui convient. That suits him. Cette robe lui va. That dress suits her. appeler à; être à; comparer à; faire attention à; habituer à.
Ce livre est à lui. Il ne fait aucune attention à eux. arriver à, parvenir à; croire à, jouer à, s'intéresser à, manquer à, penser à, songer à, renoncer à, avoir affaire à.
Il faut renoncer à elle. (Il lui faut renoncer is erroneous). Je pense à Pierre. Je pense à lui (Je lui pense is erroneous). 1) A French Reference Grammar (H. Ferrar). 2) A Student Grammar of French (M. Offold). Not the answer you're looking for? Browse other questions tagged anglais pronoms or ask your own question. When should a direct object pronoun be ommitted? How to say, “I will get him to get it done for them” in French using object pronouns?